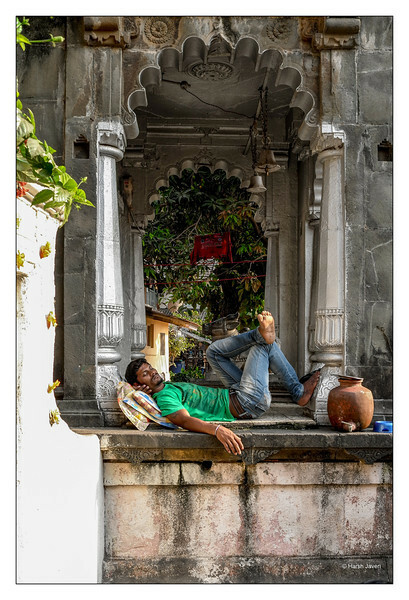 This man was having a nap near the entrance to a temple. It was great to see this pic placed in #2 place! Thank you all! This was shot on a Sunday! :-) Forgot to mention, as the jpg looked fine (also have the RAW file), I've used it SOOC except for a slight crop. I love the pose under the ornate arch! Super shot! Such a neat capture and love the pp. He looks perfectly content resting underneath that beautiful arch. Your timing and composition are superb. Fabulous; love the shot and the pp is perfect! This is a lovely capture. However, I would suggest a tighter crop to eliminate some of the left and bottom. Exotic locale, but universal subject. I like the detail of his having lifted one foot up off the ground, resting it against the column. Also like the patch of red cloth hanging beyond the distant arch, helping to lead the eye into the space.